This morning around 7am a truck carrying pigs to their death tipped over outside Fearmans Pork Plant in Burlington. Media outlets are reporting that some of the pigs died in the crash and many others were injured. Those pigs who were able to walk were marched in to the slaughterhouse to meet their death. Activists arrived on the scene soon after the incident occurred, and over the day their numbers grew. Tensions between the workers, the police, and protesters continued to escalate while the squeals of terrified, injured, and dying pigs filled the air. Steve Jenkins from Happily Ever Esther was on site pleading for mercy for the pigs, and offering to take some of them to his sanctuary, but his requests were denied. I was not in Burlington this morning, but was watching this unfold via social media. My heart was heavy and tears streamed down my face. This was a horrific scene, but let us not forget – this is only in the news today because a traffic accident took place. Each and every day, truckloads of terrified and injured pigs arrive at this location except, most days, only those who have chosen to bear witness as part of the Toronto Pig Save vigils pay any attention. The routine suffering that happens at this location is not normally deemed newsworthy. Perhaps the most striking part of today’s incident were the reports that workers were holding up barriers in an attempt to block the pigs from the view of people who had gathered at the scene. They must not be seen. To see the suffering, fear, and confusion these animals were experiencing would be upsetting for most people, so those who were in charge of the scene took steps to try and prevent people from seeing what was happening. Let’s get something straight – this is upsetting. Whether we choose to look at this or not, suffering is taking place. One set of pictures taken by activist Andrea White appears to show an injured pig being comforted by another pig. It was not long, however, until workers were holding up large pieces of cardboard to block this moment of tenderness and compassion from the sight of cameras and prying eyes. We must ask ourselves why this kind of scene was perceived to be so threatening. What would happen if people witnessed this exchange? Would they, perhaps, begin to rethink their own complicity in this scene of suffering? A pig comforts another pig who is injured and can not stand up. Photo by Andrea White. Workers hold cardboard barriers to keep the injured pigs out of sight. Photo by Andrea White. This overt attempt to block witnessing and taking pictures is a very significant part of this story. It strikes at the heart of what Timothy Pachirat has referred to as the “politics of sight.” In other words, our contemporary food and agricultural systems in North America are sustained by carefully regulated systems controlling who gets to see what. Out of sight, out of mind. If you don’t see something, it is hard to question it. A pig who escaped a transport truck runs along Ontario Street in St. Catharines, Ontario in July 1945. Photo by St. Catharines Standard. I have frequently walked down the streets that this determined pig who lived and died in 1945 travelled along and, as I do, my mind often turns to this photograph, and I think about the pig who tried to get away. I wish with all my heart that she had. The article accompanying the photograph tells us that as she was running around she spotted “some luscious grass” in a nearby park and began running towards it. While my heart breaks for this pig I never knew, the tone of the media reporting of this incident is such that this pig is granted a sense of agency. Sure, there is still a struggle between the pig who wants her freedom and those who want to eat her (she had a narrow escape, we are told, from a driver who had “a hungry look in his eye.”), but the pig here is recognized as a sentient being, one who has tried to change her fate – “This Little Pig Didn’t Stay Home,” the headline proclaims. While things didn’t work out in the pig’s favour, she is still recognized as an individual with preferences and determination. She wanted to get to that grass! There is a decidedly different tone to the reporting going on with today’s incident at Fearmans. There was an active and deliberate attempt to shield the pigs from view. Activists were kept away “for their own safety,” we were told, and yet, was that really what this was about? How is being denied the sight of one pig comforting another going to help anyone be safer? What seems instead to be going on here is a deliberate attempt to suppress any recognition of agency or emotion in these animals. It is for our own good, we are told. You don’t want to see that. And yet if we don’t look or aren’t permitted to see, how can anything change? The question of animal sentience is increasingly being explored in books, films, and articles in the popular press, and yet, paradoxically, there are ever-tightening restrictions on who gets to see the animals who live and die in our food production systems. From the so-called “ag gag” laws in the United States, to the makeshift cardboard barriers that workers held today in Burlington in an attempt to prevent the suffering of pigs being made visible, there is a deliberate and concerted effort to make sure that these lives and deaths remain culturally invisible. Around 1870 Louisa May Alcott, author of Little Women, witnessed an act of compassion that deeply touched her. She had been on a train journey, and near Fitchburg her train pulled up alongside another train at a station stop. As she waited for her train to continue, Alcott passed the time by looking out her window at the sights — a beautiful waterfall caught her attention, but she also noticed that in the train next to hers were several cattle and sheep crammed in to rail cars. 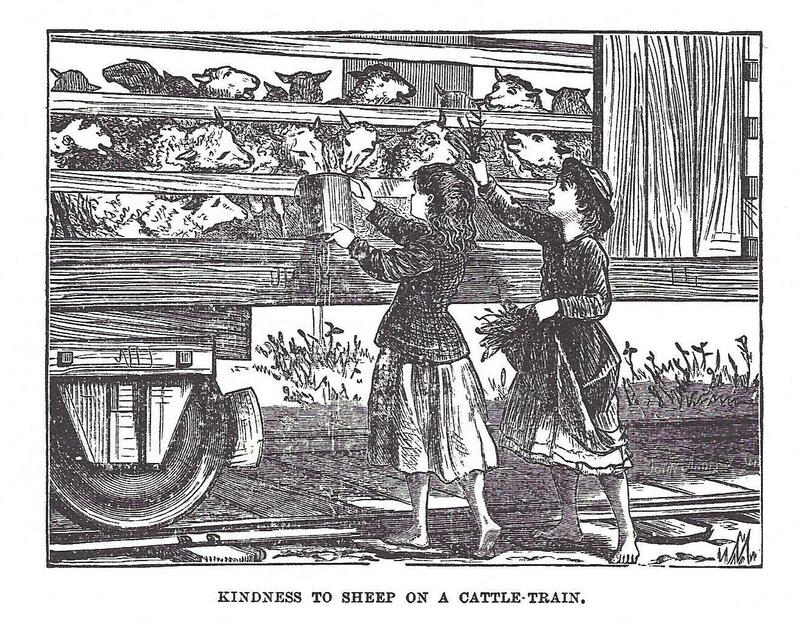 This story was repeated in a number of 19th century animal advocacy and humane education publications, often with the above image accompanying it. The actions of these two young girls became a lesson in kindness and compassion. Over 140 years later a similar story is being told. Members of Toronto Pig Save, a grassroots organization that aims to bear witness to the suffering of animals who are raised and killed for food, have made headlines for giving water to pigs arriving at slaughterhouses on transport trucks. Their actions mimic those of the young girls that Alcott wrote about in 1870. This past summer, a heated exchange between one of the activists, Anita Krajnc, and the driver of one of the trucks has led to a criminal charge of mischief for Krajnc. It is utterly absurd that we live in a world where kindness and compassion is criminalized. What, I wonder, would Louisa May Alcott have to say about this ridiculous charge? *This post was also published on The Unbound Project website. 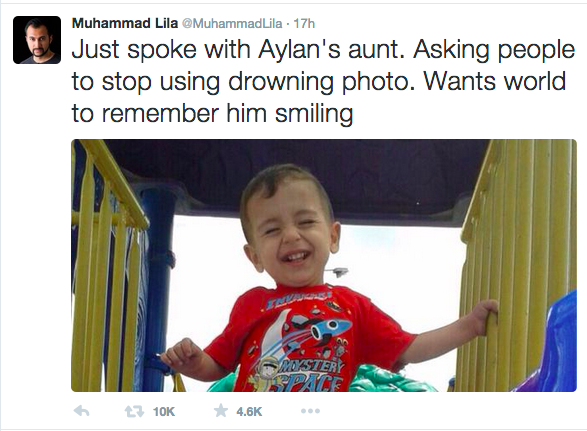 This week the world is talking about Nilüfer Demir’s photograph of little Alan Kurdi. This is a powerful, heart-breaking photograph, one that Demir has said she wishes she had not had to take. It has already been added to the list of the most “impactful news photographs” ever made, and for many has come to stand as shorthand for the complexity of the political, social, and cultural turmoil and tragedy that is the current refugee crisis. There has been much debate about whether or not news agencies and media outlets should have published this photograph. Some are arguing that with this single image, much-needed attention has finally been focused on the fact that thousands of people are taking desperate measures to seek a better, safer, more stable life. People, governments, and media outlets are paying attention, and, if one reads the headlines, there is a sense that the collective outrage is growing. Organizations working to assist refugees report a spike in donations in recent days, something that is being directly attributed to this photograph. And yet, the publication of this photograph also raises other very important ethical issues. For example, as Natasha Lennard has argued, there is inconsistency in which dead bodies are deemed acceptable to be shown in the media. Further, some have made the point that while this photograph might have sparked outrage about the circumstances of this particular death it hasn’t necessarily translated in to increased public support for assistance for the thousands of people displaced from their homes in a broader sense. Does a single image have the power to shift the conversations and political will towards a solution to the current crisis? Demir’s photograph is powerful and has captured global attention because of who it depicts. Alan Kurdi was a young child, and this photograph goes against all of our ingrained ideas about what childhood is supposed to look like. This photograph also focuses on an individual, someone who had a name. It is easier for viewers empathize with an individual than with a large group. Yesterday Muhammad Lila tweeted that he spoke with Alan’s aunt who has requested that people stop circulating Demir’s photograph. According to Lila, she would rather have people remember Alan as a happy toddler. This plea is echoed in Lennard’s comments, as she notes that in images like this “the memories of lived lives are reduced to corpses.” How do we reconcile Alan’s aunt’s request with the arguments that Demir’s photograph has generated more attention on the refugee crisis than other images or reports have been able to do? It seems there is a fine line that exists between witnessing and exploitation when it comes to photographs like this. I’m reminded of W. Eugene Smith’s powerful photographs of the mercury poisoning in Minamata. Smith’s photographs made visible a tragedy that was hard to visualize — what does mercury poisoning look like? Smith took what was for many an abstract idea and put a human face on it. Smith’s most famous image from Minamata is a photograph of Tomoko Uemura being bathed by her mother. Tomoko’s body showed visible symptoms of mercury poisoning, and her family agreed to allow Smith to take this photograph in the hopes that the circulation of the resulting image would raise awareness of the ways in which individual lives were transformed by the exposure to mercury. This, of all the photographs that Smith took, became the iconic image of the tragedy in Minamata. It evoked anger and calls for action. However, it was also a photograph that Tomoko’s family later decided they no longer wanted circulated. Out of respect for these wishes, Aileen Smith (who became the copyright holder of W. Eugene Smith’s estate after his death), transferred the copyright of the photograph of Tomoko Uemura to her parents who have since refused to allow it to be used. In a similar way, Demir’s photograph has taken what is, for many, an unimaginable and hard-to-fathom tragedy and made it accessible. And this is really important. But what are we doing with this newfound awareness? Will anything change? If not, why is this image being circulated? Further, if, as Lila suggests, Alan’s family is requesting that Demir’s photograph no longer be used, do we have an obligation to comply? In his powerful book, Bending the Frame: Photojournalism, Documentary, and the Citizen, Fred Ritchin wonders “Which kinds of image-based strategies might best engage readers, and which might manage to respect the rights, and the agency, of those depicted?” (p.7) I think this is an important question for us to keep in mind as we grapple with the complexities of Demir’s photograph. Is there a way to bear witness to this crisis and to empathically connect with those at the heart of it in a way that does not reduce someone’s life to an abstract symbol?